6) improves nervous system energetic flow. The Acuball’s specially designed acupoints and heat stimulate blood flow. This increases circulation, helping to ‘flush out’ built up toxins that accumulate in tight muscles causing pain. As these toxins release over time the muscle itself relaxes. Direct pressure from the acupoints also massages muscle and mobilizes joints, further enhancing pain free body movement. The acupoints also stimulate your Central Nervous System, like acupuncture does, to release natural painkilling, relaxing and mood enhancing chemicals like enkephalins and endorphins. Because of this, people who use the Acuball in bed, before retiring for the evening, often report enhanced feelings of relaxation and deeper sleep. When you use the Acuball on a tender area, you’ll notice that after three or four 20 minute sessions it’s a lot less tender than when you first started. Now you know why: wastes have been flushed out, muscle has been relaxed, joints have been mobilized, and your nervous system is much less irritated…and so are you! If you like the feeling of heat on tight sore muscles, you’ll love the Acuball’s unique patented heating ability. You certainly don’t have to heat it, many people use it at room temperature, but you should try it. People have remarked countless times that they love the sensation of deep penetrating warmth on sore, achy muscles. Many people love taking a heated Acuball to bed with them. Why does it feel so good when it’s heated? Heat expands muscles, causing blood vessels to open up, bringing more blood to tight areas. This increased blood flow flushes out accumulated wastes, calming irritated nerves and loosening muscles back to their normal relaxed state. Many spinal problems come from tight muscles which cause vertebra to lock together, ‘jamming up’ instead of flowing freely. The Spine Align Belt, a precision molded groove running around the middle of the Acuball, allows you to lie directly on the Acuball – opening and loosening your spine one vertebra at a time. Like pulling an accordion open, this helps to ‘free up’ your spine all the way from your low back up to the top of your neck. The acupoints at the side of the Spine Align Belt also give an acupressure treatment to the important postural muscles running along both sides of your spine (the erector spine muscles), allowing them to open and relax. Better spinal motion, improved Central Nervous System flow (since your Central Nervous System runs through your spine) and improved posture result. The area where your neck meets the back of your head is a key area for wellness enhancement. Why? Because it is here that your brain exits your skull and becomes your spinal cord, transmitting vital information to every part of your body. Any tightness here affects your brain’s ability to optimally communicate with your body, so you want this area to be as loose and flexible as possible. Because we spend so much time with our heads bent forward – working, computing and care-giving this area is almost always tight. The Spine Align Belt allows you to open this crucial area, which as you’ll experience for yourself, feels truly wonderful. The zone on the bottom of the Acuball has multiple smaller acupoints for doing lighter work like releasing tight muscles in your scalp, face and temples or massaging your child. The larger acupoints on the rest of the Acuball are for deeper work like loosening larger muscles in your neck, legs, hips and low back. 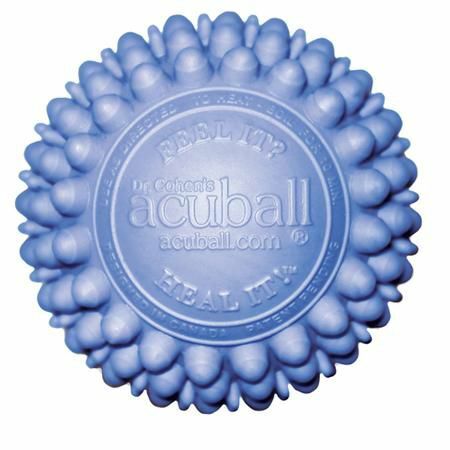 The Acuball-mini’s smaller nibs and harder feel make it perfect for releasing tight muscles in the smaller muscle groups of the body such as the feet, hands, shoulders, upper back, arms and forearms. It is particularly effective in the feet for relieving painful conditions like plantar fascitis. Athletes (golfers, runners, tennis players) use the Acuball-mini before their activity to loosen problem areas in their feet, shoulders or arms to enhance muscle performance and reduce risk of injury. It’s also an excellent massage tool – try massaging your friend’s shoulders and neck with it!